We are a trusted name in the industry for supplying and exporting Herb Grinders. For us, no order is too big or too small for compliance; with this ideology we present here CNC Acrylic Grinder that is appreciated all over the world for its numerous features including low maintenance and optimum performance. We also give high emphasis on sturdy construction and adherence to the standards of the industry. Caption Pipes Pvt Ltd is one of the credible Manufacturer, Supplier and Exporter of Acrylic Grinders. These Acrylic Grinders are greatly appreciated for their compact design, smooth surface finish, and easy usage. Acrylic Grinders are available in different designs and sizes, catering diverse demands of the customers. aircraft grade aluminium hi tech digitally designed made on cnc machine. Article no: 941 size: 20 x 62 mm (dia x height) 32 grams. Bounty Fashion Exports is a trusted grinders manufacturers, suppliers & exporters based in India. It is a vital part of the smoking accessories and widely used in crushing sticks. We are offering these in wide specifications in order to meet the exact demands of the buyers. Owing to the optimum quality materials and ultra-modern machines applied in its making, the offered assortment of Plastic Grinders is well known to be amongst the first choice available in the industry. Owing to the years of industrial experience, we have been able to serve our valued clients with a wide range of Glass Pipes. We are offering Plastic Grinder to our client. We are considered in the industry to be one of the leading names of this impeccable assortment of Plastic Grinders. Compact Runner Grinder for online grinding of runner. 10 KG / HR Capacity with low speed Imported Geared Motor 1.5 HP / 3 Phase. Low Power consumption with no additional Manpower requirement. Grinding suitable for all types of Plastics . 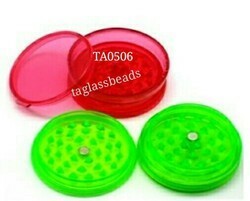 We offer Acrylic Herb Grinder with the storage facility. These acrylic herb grinder has a clear, transparent look and is very stylish in its approach, with compartments made for storing colors. We are amongst the most reputed names in the industry, offering Plastic Herb Grinders. Four Part Grinder in Rasta Colour - Material - Plastic - Colour - Rasta - Diameter - 55 mm -This is a speciality grinder with four chambers to make the job easy. we produce highest quality Metal Pollen Herb Grinders. Our CNC grinders are made of Aeroplane grade aluminum material and made on automatic CNC machines.